There are lots of regional characters in Japan, Most of which officially belong to certain prefectures, cities, towns and so on. A well-known character, Hikonyan, is Hikone city’s official character, and the Kumamon character was created by Kumamoto prefecture. 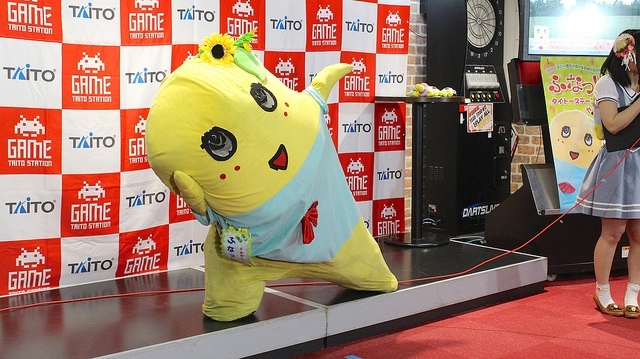 However, the recent most popular character of Funabashi city (Chiba pref. ), Funassy, is not official. Funassy began his unsolicited association with Funabashi for the simple reason that he loves Funabashi city. According to Funnasy, he is a fairy of “nashi”(=pear) which is one of Funabashi’s local products. One of his unique attributes is that he speaks, while other regional mascots mostly remain silent. For those who don’t know Funassy, here is a video of his performance in a comedy show. He always adds “nassy!” at the end of his sentences and he moves in a very funny way. The number of Funassy fans like myself is increasing day by day, and what’s more, a lot of female fans are now crazy about him. Yes, they fell in love. So today, I would like to share Funassy’s five essential elements to becoming popular with the ladies. Look at his jumps! Amazingly high and beautiful!! Funassy is always positive and never speaks ill of others. He not only waits for offers from his clients, but positively keeps making proposals for better results. Some of Funassy goods are produced in the 3.11 disaster-stricken area to promote employment. He donates a part of the sales and holds events to support the revival of Tohoku, but never shows off those charity activities. He often leaves funny impressive words in the media. It must be fun if we can go have a drink with Funassy!